Your thermostat is the key to your comfort. It also affects the energy efficient functionality of your heating and cooling system. If it’s not working properly, you can quickly find yourself paying higher than usual electrical costs.Get the ultimate control over the temperature in your home! Call (937) 488-4758 and find out about our money saving programmable thermostat solutions. We service Dayton and all the surrounding areas! At CJS Heating & Air we offer the highest quality programmable thermostat solutions for all our customers in and around the Dayton area. We can install these systems in your home, and help your program them for optimal functionality. Also, should there be an issue in the future, we offer expert thermostat repair solutions as well. Thermostats, in basic terms, are what controls your entire heating and cooling system. They monitor the temperature in your home and adjusts it in order to keep your home comfortable and at your desired temperatures. As it ages however, it can slowly become a weak point in your heating and cooling system. A programmable thermostat is the latest in heating and cooling technologies. It functions by keeping your system working at efficient level at all times. The thermostat can also be programmed with specific cooling and heating cycles in order to keep your energy consumption down when you’re not in your home. Energy Efficiency – When you install a programmable thermostat in your home, it will help to keep your heating and cooling system efficient. By only functioning in specific cycles, you will avoid wasted energy and only use your system when its needed to cool the home. Added Comfort – With a programmable thermostat you will have the ultimate control over the heating and cooling in your home. This allows you to keep your home comfortable and at the temperatures you want. Additionally, you can adjust temperatures according to the likes of those in your home as well. Better Operation – One issue with older thermostats is the fact that at some point, they will no longer be able to accommodate accurate temperature readings. This can cause the system to work much longer than it has to just to reach the right temperatures. 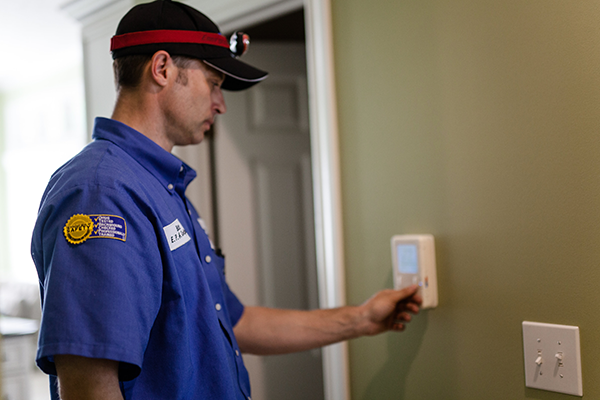 WIth a new thermostat in place, you will enjoy perfect operation all year round. With the help of our highly skilled and trained professionals, you will be able to enjoy these benefits in no time. We have various models of thermostats available for your home, and can provide you with fast and reliable thermostat installation services, which will have you enjoying the temperatures you want, all year long. When should you consider this upgrade? At CJS Heating & Air, we are your go to thermostat specialists. Whether you’re in Dayton, or the surrounding areas, our highly skilled and trained staff will be able to provide you with an expert solution. With over a decades worth of experience, we know that we have the experience needed to get the temperature in your home under control. With our programmable thermostats, you will enjoy comfortable temperatures all year long. Also, with programmable heating and cooling cycles, you will rest easy knowing that your HVAC system will never waste energy throughout the day. So let our technicians help you today, and get the high quality solutions that make us the number one heating and cooling company in the area! Are you ready to upgrade your old thermostat? Call (937) 488-4758 and save money with our industry leading Dayton programmable thermostat solutions. We will provide you with quality solutions in no time.